M(i)s Ch(i)ef™: Hot Home Cook! We love having dinner parties and I enjoy trawling the recipe books and magazines for things to prepare for our guests that will be impressive looking and delicious. Sometimes, however, no matter how long I trawl, I can't find the right thing. I'm all for preparing days in advance when I have lots of time, but most weekends when we have friends round it's a marathon Sat to shop, clean, tidy the house and cook! The last occasion I realised that my efforts of fine dining where really too stressful and what we have for dinner on a daily basis, presented nicely, is exciting enough to serve for our guests who are envious of our lunch leftovers!I put this to the test at our last dinner party. 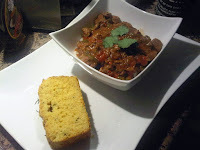 A week before my hubbie had made a fabulous beef chilli in the slow cooker so we decided to try this out with our guests. With autumn kicking in, the evenings are still cool enough for a warming, spicy feed, and the slow cooker is a sure win for juicy tender meat that melts in the mouth! To step the menu up a bit I found a delicious and simple cornbread recipe to accompany the chilli. It looked impressive, sliced beautifully (no crumbly slices) and balanced the spice of the chilli really nicely. 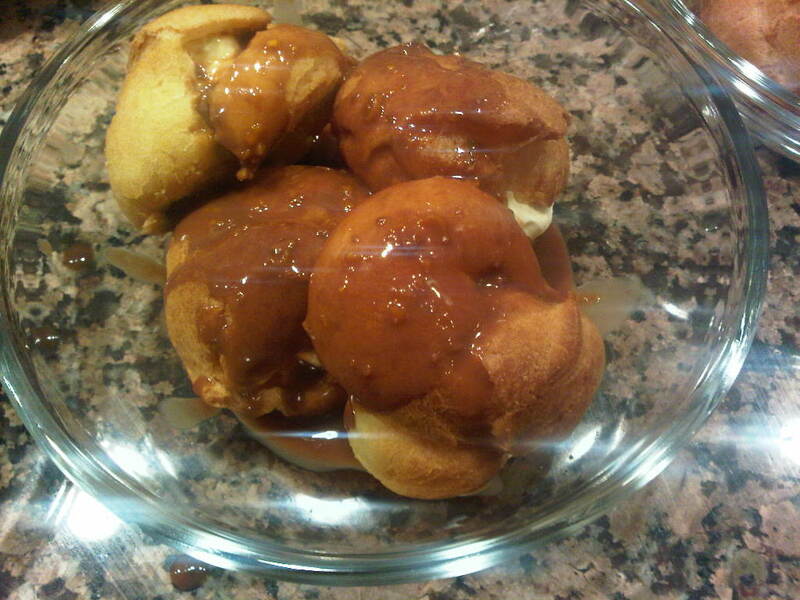 For dessert, an old favourite with a twist: profiteroles with chocolate orange sauce. 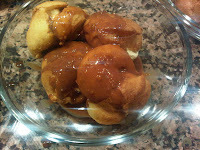 I can whip these up pretty quickly and they are an easy dessert to prepare prior to the guests arriving. A little orange zest in the cream gave it a citrusy flavour and a glug of Sabra, an Isreali chocolate orange liqueur was an unusual addition to the chocolate sauce. All in all, our guests were delighted and it was a much easier and enjoyable evening being a hot home cook than a fine dining fail!